The guys over at Muscle Car Of The Week have done a splendid job in this video of featuring a 1967 Ford Mustang Fastback with only 3.4 miles on the clock. This one is possibly the lowest mileage 1967 Ford Mustang in existence. Its not the most potent Mustang in the world with a base level 289ci 2V V8, a four speed manual transmission and an 8 inch rear, but that’s not the focus here. The car is basically as it was new and isn’t even dealer prepped – no center caps or floor mats. The engine bay shows some signs of rust as do a few of the components, but this can be forgiven as the rest of the car is as new, considering its 30 years in a Nebraska climate. The other standout point is that ‘special’ paint which wasn’t even available to the public. 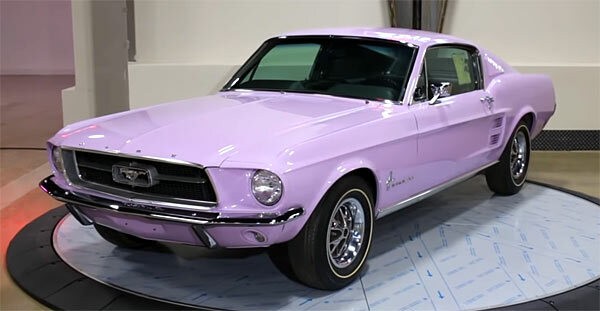 The window sticker only notes it as being ‘special paint’ and the nearest color possible was a ’67 Evening Orchid, but what this Mustang’s ‘special paint’ is named is still a mystery. The Mustang also has the options of a special center console, AM radio, deluxe seat belts and tinted windows. The rest of the car is the standard 2+2 layout. The car was originally bought by a Bob Mercer, who owned a Ford dealership in Nebraska. The idea was for him to buy brand-new vehicles of the day, keep them as new for 30+ years until he retired and then sell them for a profit. clearly, the idea worked as this Mustang is now in the Brothers collection being an as new ’67 Mustang time capsule and the lowest mileage 1967 Mustang in existence. Makes us wonder if a pony car was purchased today how much it will be worth if kept in brand-new condition 30+ years?? If anyone out there is planning this themselves, please drop us an email or equivalent in 30 years, it would make a great article.